In April 2014, UC San Francisco has announced the cooperation with Japanese drug maker Daiichi Sankyo, which is a global pharmaceutical company and the second largest pharmaceutical company in Japan, for a multiple drug-discovery program on tackling neurodegenerative diseases. These programs will focus on studying the role of prions, misfolded replicating proteins that were initially identified by UCSF researchers, and these proteins' role in the development of neurodegenerative diseases. Scientists at Daiichi Sankyo and UC San Francisco will perform high-throughput compound screenings and optimizations to identify molecules for novel therapeutics in disease areas such as Alzheimer’s, Parkinson’s, Creutzfeldt-Jakcob disease and Frontotemporal Dementias. Under the terms of the agreement, Daiichi Sankyo will not only provide its compound library and its researchers to the UC San Francisco, but also will provide research funding as well as milestone payments for successful clinical progression and commercialization of new products. Daiichi Sankyo in return will have the option to license and commercialize promising new products discovered in the course of the programs and research. Only a couple of months before the cooperation with Daiichi Sankyo was announced, Samsung Electronics Co., Ltd, which is the world’s largest information technology company from South Korea, announced its partnership with UC San Francisco in the establishment of the UCSF-Samsung Digital Health Innovation Lab. This collaborative innovative laboratory will provide a new space for the world’s leading researchers and technologists to develop and run trials to validate new sensors, algorithms, and digital health technologies for new preventive health solutions including new mobile health technologies. Advanced technologies in the mobile health field such as wearable computers, health sensors, and cloud-based analytics, can help people take control of their own health and improve their quality of life. These improvements come onto the market every year, however, without systematic medical validation, most of these mobile health technologies have struggled to gain widespread adoption by consumers and healthcare professionals. Meanwhile, many researchers have creative ideas for new mobile health devices but lack of the further technological knowledge to fully develop them. The UCSF-Samsung Digital Health Innovation Lab will address this challenge by leveraging UCSF’s expertise in medicine and digital health with Samsung’s leadership in electronics and mobile technologies to accelerate exciting new health mobile technologies that will truly change lives. The collaboration with Daiichi Sankyo and Samsung ties in with a strategic goal of UC San Francisco to advance its research in health and medicine with innovative industries. With its excellent research programs and dynamic partnerships with world’s leading companies, the University of California, San Francisco not only attracts the top global talents, but also receives abundant funding and grants from public and private organizations. In April 2014, UC San Francisco received a grant of $100 million from Lynne and Marc Benioff to UCSF Benioff Children’s Hospital to strengthen the programs in basic clinical research and patient care. In January 2014, UC San Francisco received an award of $2.7 million from the Bill & Melinda Gates Foundation for a collaborative project aimed at reducing premature births. UC San Francisco has been awarded grants of more than $500 million from the NIH in 2013 and $81 million so far in April 2014. For lab supply companies, UC San Francisco is a well-funded marketplace with world class researchers who are eager to adopt the newest technologies and improvements in lab supplies and equipments. 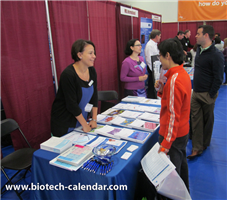 Biotechnology Calendar, Inc. is helping lab product and research supply companies to connect with the researchers at UC San Francisco, and to educate them about the newest information of research and innovations, at the 9th annual San Francisco Biotechnology Vendor Showcase™ Event at UC San Francisco on June 5, 2014. Last year, the Biotechnology Vendor Showcase™ Event at the University of California, San Francisco attracted 280 attendees who were from 21 different research buildings and 44 on-campus departments. Of these attendees, 35% were researchers and purchasing decision makers. 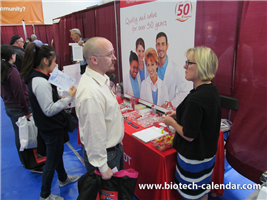 Or if you want to know more about Biotechnology Calendar, Inc.’s shows located across the nation, please click: National Show Schedule for 2014.